"We should think about what we mean by literacy. If you say, "He's a very literate person," what you really mean is that he knows a lot, thinks a lot, has a certain frame of mind that comes through reading and knowing about various subjects. The major route open to literacy has been through reading and writing text. But we're seeing new media offer richer ways to explore knowledge and communicate, through sound and pictures." 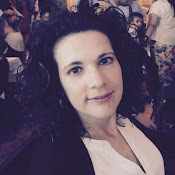 Mother's Day was filled with sunshine, laughter and the usual mess of having the kids home for two days in a row; roaming indoors and out and savouring the freedom that unstructured time provides. However what was interesting for me was that this weekend Caleb expressed an interest in learning how to use the Rainbow Loom. Not one to spend much time on crafty business, he had passed up opportunities using the extra loom I had picked up for him a few weeks ago. But early Saturday morning I noticed him watching Cadence work from afar. He eventually made his way to her side and spent several minutes observing her. Was it hard? Could he borrow her stuff? Did she have extra elastics for him too? Would she help him if he got stuck? He peppered her with questions. She timed her answers to the crescendo of video clips as she worked on her Ninja Turtle design. And then something caught his eye in the corner of her screen. He was sold. There, in bright red and yellow, was the most comical looking elastic-y hotdog. And with that he was off to gather his loom and iPad, and set to work on the kitchen table. After an hour or so I heard him set his hook down with a clatter. I approached him to see how it was going. "Terrible!" he responded. "The girl is this video doesn't give good directions. I have no clue what to do. She's not making any sense." Caleb's frustration trying to following someone's inadequate directions reminded me of how powerful and precise oral language has to be in many of life's situations. Not only do we need clear and direct explanations, we also must be ready and able to carry out the directions in the manner they were given in order to experience success. He was unable to make a Rainbow Loon hotdog because the directions did not make sense to him. I immediately thought of coding. In the past I have spent much time linking coding to math due to the rich, integrated opportunities for number sense and geometry it provides. But what about literacy? 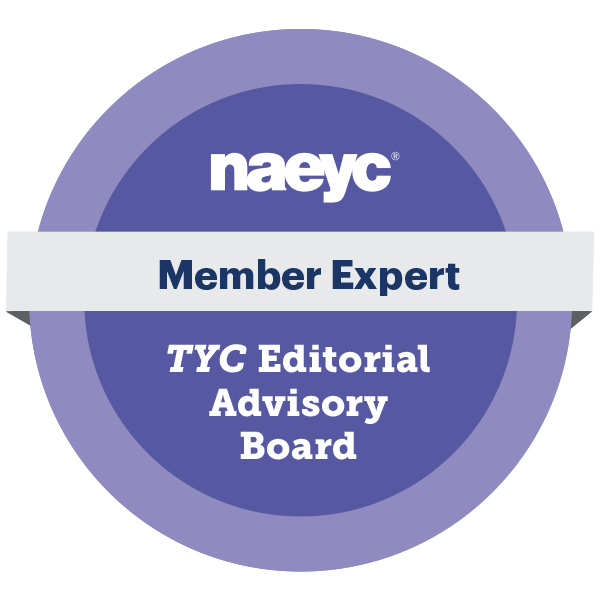 Many educators are continuously looking at ways to embed and improve meaningful language-based activities in their emergent programs. Can coding help with this? How does coding encourage users to become more proficient communicators? Can coding strengthen kindergarten literacy programs in the same ways it does math? Coding requires accurate language in order to be successful. Computers follow the code outlined in their programs. There is no room for interpretation, and as a result, a programmer must be incredibly clear and detailed in their algorithms. When children use coding as a language of communication in the classroom they practise this succinct way of articulating directions to others on a regular basis. Over time they will improve in their abilities to be precise when crafting these programs and directing others in activities. Coding reinforces concepts of print. In our classroom children are encouraged to write their code in different ways. They can order our class set of coding cards on the floor or in a pocket chart, or they can write their directions using a series of predetermined symbols (e.g., arrow, stop sign). When writing or reading these directions they are encouraged to move from top to bottom, left to right replicating the way we read and write in the English language. I always ask them to use their 'reading finger' and point to each card as they work. This reinforces the same concepts of print we are working on in our whole and small group literacy activities. Coding uses symbolic language that children will be able to read and write even if they are not yet fluent using letter and sound relationships. 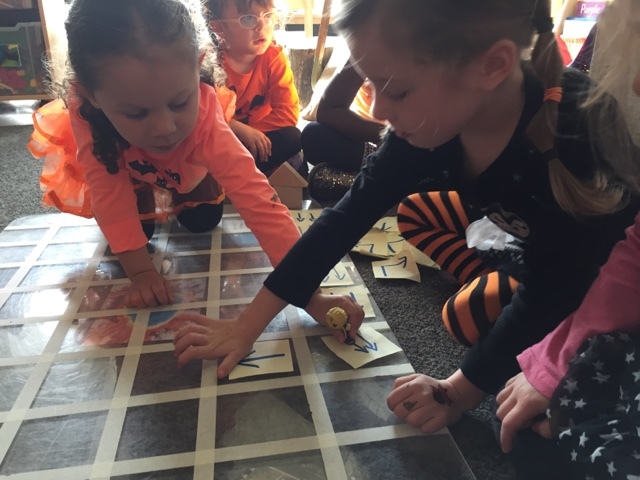 Because kindergarten coding uses pictures, many children can easily create messages for one another by sequencing coding cards, or drawing established symbols digitally or on paper. A class can determine their own set of symbols before coding work begins so that everyone understands what they represent. Over time and with experience children will become proficient communicators using these. 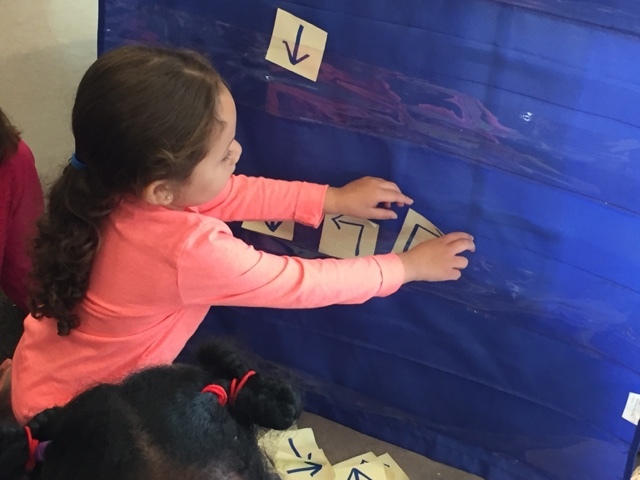 Just as early mark-making is a foundational part of establishing positive literacy behaviors, coding helps children easily communicate their ideas to others showing that oral language can be translated and preserved in multiple ways. 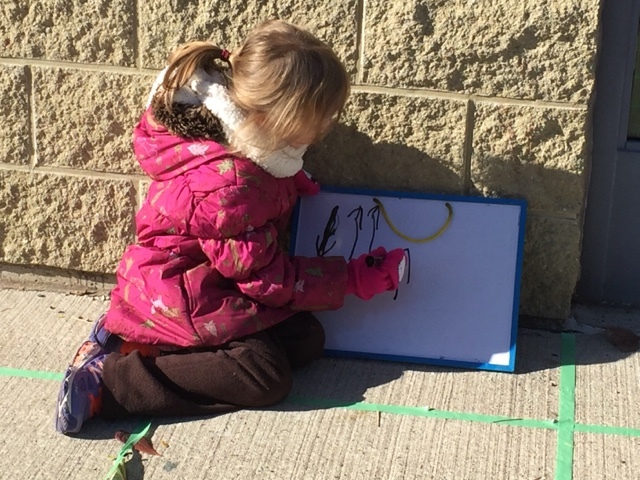 Coding builds confidence and fluency in early readers and writers. With practice children will improve in their abilities to communicate using symbolic language. In our classroom coding activities are always very popular and as a result even the most reluctant children in more traditional literacy activities want to participate. This grows their mindset and confidence because the more they practice, the better they become. Coding encourages active listening. Regardless of how well constructed an algorithm is, it can only be successfully implemented if a child is listening intently and following through successfully on the given directions. Coding work requires concentration and full engagement. This helps children practise being attentive and responsive listeners. Coding is a universal language that helps people speak to one another all over the world. In our classroom children blog and tweet extensively about their daily experiences. A very important part of the inquiry process is sharing one's understanding beyond the metaphorical 'walls of the classroom'. Because coding is used all around the world (and such a hot topic in education right now) children can participate in a global event, communicating with children in different countries, even where English is not the common language. One of my daughter's favourite things to do online is look inside the many creations posted on the Scratch website so she can see the code that was used. Coding sequences a story from beginning to end which requires users to group events together and retell them in the proper order. In our classroom children often use favourite texts as the foundation of their coding games (e.g., retelling the events in the Gingerbread Man; helping the Gingerbread Man escape the fox at the end of the story). This means that children need to be able to accurately sequence a story in the correct order so that it makes sense. They need to consider the beginning, middle and end events and retell these in their coding directions so that the game makes sense. This strengthens their comprehension of literature and encourages them to demonstrate their knowledge in hands-on ways as they play with stories. Coding often tells a story that requires users to imagine setting, characters, and plot. This reinforces comprehension of texts, especially when favourite read alouds are used as the inspiration behind activities. 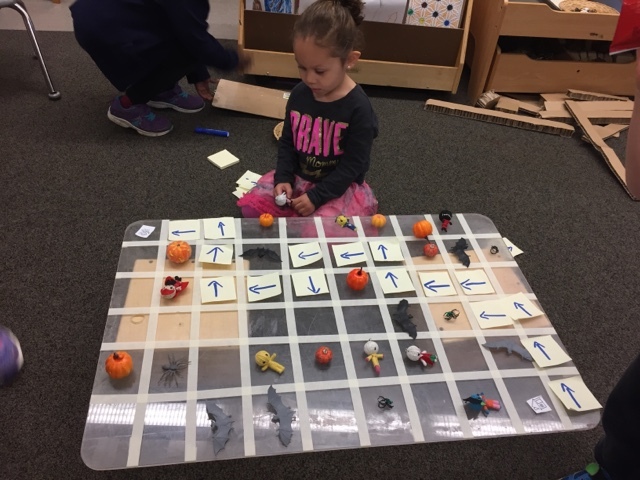 When creating their own stories using the coding board, children need to establish their own engaging characters and plots in order for the activities to be fun to play. Coding is found in our daily routines as we compose instructions to one another in our classrooms and beyond. Thinking and communicating in algorithms extends beyond coding activities. There are multiple opportunities each day for adults and children to give and receive directions to others. When we think as coders, we realize that we are more effective and efficient when our communication is clear and easy to follow. Children can be reminded of this in their work outside of programming. Educator Brian Aspinall (@mraspinall) emphasized at a recent PD event that I attended that he asks his students to "speak to each other in algorithms" in daily activities, even those unrelated to coding, in order to emphasize clear and direction language. Coding can become an expressive language, much like the arts, helping children to articulate their ideas and show their comprehension to others. 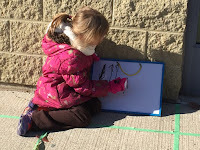 Emergent programs influenced by Reggio Emilia encourage children to explore and share their learning using 'hundreds of languages' including the arts, physical expression, and building. Coding can become another language children use to communicate in inquiry-based classrooms, especially once they are proficient using it on a regular basis. For example, why not encourage a child to demonstrate their understanding by creating a code to show and share their new knowledge with others (e.g., coding the lifecycle of a butterfly). How else does coding encourage literacy in the classroom? Share your ideas in the comment section below or tweet me @McLennan1977 and tag it #codingandliteracy.